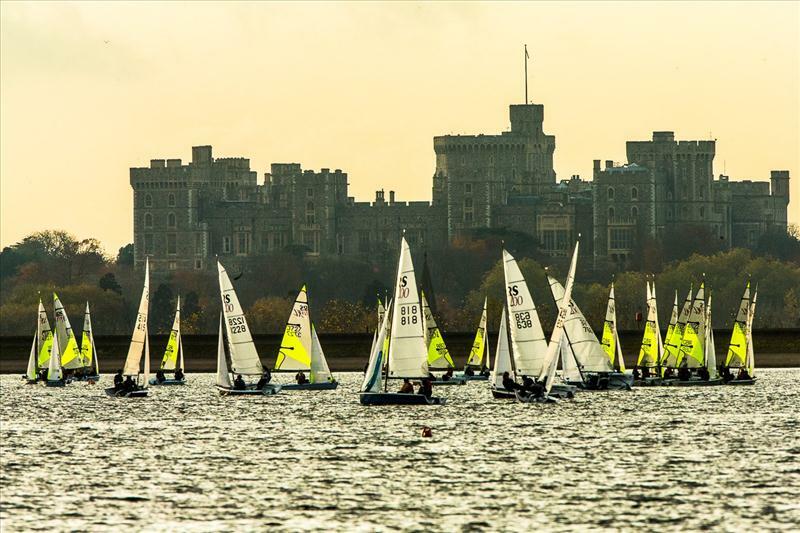 The RS Feva End of Season Championship became a big family affair this year, with 153 boats from across the 'RS family' joining in at Datchet Water SC on November 10/11. The 51 Fevas were joined on a trapezoid course by 35 RS200s; whilst RS100/300/400/500/600/700/800s raced on a second trapezoid course. The forecast was a chilly but sunny 10 knots but in reality cloud & a max 5 knots, was the order of the day. The first start was delayed allowing time for the sailors & race team to get ready after a prolonged competitor briefing. After a black flag start, racing got away clear, an hour after the schedule. Leading at the leeward mark was Tom Darling & Will Dolin with Will & Matt Taylor in 2nd & Harvey Martin & Will Ward in 3rd. With the wind fickle & dropping Tom & Will managed to hang on to win race one; 2nd Harvey & Will; 3rd Arran Holman & Josh Haynes. Conditions were made extremely challenging as the committee boat was restricted to a 'fixed' mooring which resulted in lack of space whenever the wind swung right. The race team managed to 'tweak' the course for the second race & the 200's were sent off whilst the Feva's were still plodding around the long course. The 2nd race started & leading at the windward mark was Robbie & Alex King with Arran & Josh in 2nd whilst Hannah Bristow & Bobby Hewitt were 3rd. By the leeward mark Elliott Wells & Jake Todd had climbed through to 2nd with Hannah & Bobby still in 3rd. The shifting conditions enabled Robbie & Alex to extend their lead at the 2nd windward mark whilst Hannah & Bobby battled with Elliott & Jake to keep swopping places only to let Tom & Will through on the final beat. As the wind dropped & the boats glided down the final run it was Elliott & Jake who coasted ahead & took the win from Tom & Will in 2nd with Robbie & Alex dropping to 3rd. The 3rd race was abandoned, as the wind dropped further, & the sun set, so the boats were sent home. On Sunday a thick frost & thin fog covered the area. The campers looked cold but the club provided a great breakfast. At 10 am on the dot, the starts got away in bright sunshine & a less shifty 5 knots, which built to 8 knots at times. Leading at the first mark was Arran & Josh despite starting 10 seconds late at the committee boat end but close behind was Courtney Bilbrough & Orla Mitchell, with Edward Norbury & Charlie Hutchings in 3rd. Elliott & Jake pulled through downwind to lead at the 2nd windward mark after overtaking Courtney & Orla with Harvey & Will now in 3rd. But there were more place changes to come with Arran & Josh getting back in front upwind with Courtney & Orla 2nd whilst Elliott & Jake dropped to 3rd. The close racing continued right up to the end but pulling back to take the win was Elliott & Jake; 2nd Arran & Josh; 3rd Courtney & Orla. After a one minute silence for Remembrance Sunday the fleets got away for race 2. Leading at the windward mark was Alex & Robbie; 2nd Arran & Josh; 3rd Harvey & Will. Arran & Josh took the lead up the 2nd beat with Robbie & Alex in 2nd whilst Samuel Grade & Katie Prescott climbed to 3rd. Arran & Josh won by a good margin; 2nd Robbie & Alex; 3rd Sam & Katie. The 3rd race of the day saw Clark Rutter & Matt Thornton ahead with Robbie & Alex in 2nd whilst Tom & Will regained their form in 3rd. Tom & Will took the lead up the next beat & then extended it at the final windward mark with Robbie & Alex in 2nd then Sam Lythoge & James Scott in 3rd. The final race was won by Tom & Will with Robbie & Alex 2nd; 3rd Sam & James. After three & a half hours on the water, the race team decided to abandon race 8 & the fleet was sent home. This gave Robbie & his brother Alex the title of 2012 EOS Champs, through their consistency over the 5 races. Last year's EOS champ Arran Holman crewed by Josh Haynes came a close 2nd whilst Tom Darling & Will Dolin held onto 3rd place by winning the final race.